Whew!!!!!!!!!! That about says it all in one word. Had a great time, even though I felt way behind before I even left. Just not enough hours in the day. I got home last night from SAGA convention. It was a blast as always. It will take me a couple of days to chronicle this oversized stitching slumber party as it deserves, so bear with me. 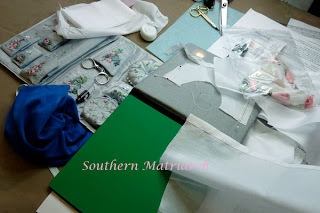 If you have never been to a stitching "gathering" whether it is a class given by a shop in your town, workshop hosted by your local SAGA, EGA, ANG or ASG, or a large convention such as this, I encourage you to do so. I frantically left home after our local SAGA chapter meeting the night before, slung my belongings together and drove to Indianapolis. I was met at the front door of the hotel by three friends. They were there before the bellman had my carp out of the car. It might be friends you only see once a year, but oh the fun you will have. My intentions were good to take photos and blog every day while I was there. Well you already know that didn't happen. 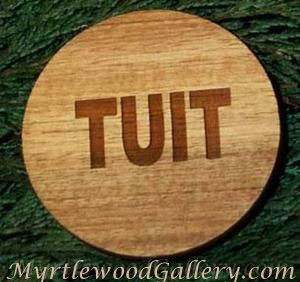 I was too busy laughing with my friends, running my mouth, eating out, having impromptu show and shares to find my "round tuit." BUT, I thought of it everyday; does that count? The first evening there we helped set up all of these for the Wee Care Display. The dress stands look much better dressed. It is really remarkable the awesome gowns some of our members lovingly make. Some are very basic and others are quite elaborate but all are beautiful. There was a welcome reception of finger foods and saying "Hey" to everyone you hadn't already seen and listening to a few words by one of our long time members about the beginnings of SAGA 30 years ago. It was SAGA's "Pearl" anniversary this year. Then it was onto dinner with about 10 of us. It began a week of laughter, friendship and comraderie. Then back to the room for the first of many show and shares. You have to bring goodies to share with one another. It is how we are inspired. We assembled Wee Care bonnet kits to give out in the hospitality room. 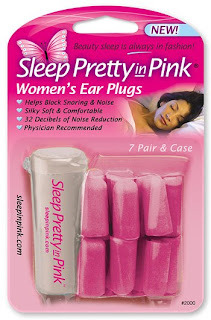 I also passed out the ear plugs. Just in case you have a noisy room mate. Thankfully none of us were that way, but just in case. The girls I hung out with had two rooms next door to one another. We just flung the bar into the door and traveled back and forth between the two in our pj's. There may have been some chocolate and liquid refreshment on occasion. MIght have been, not real sure. We giggled like school girls, caught up on everyone's lives, gathered our supplies for class the next day and got to bed way toooooooo late. Stayed tuned for the next installment. I always love to read your blog! 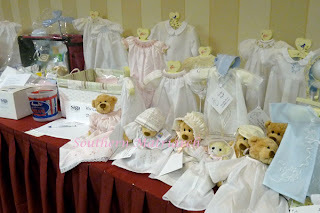 Would you mind letting me know how/where to get the dress hanger stands that you displayed the wee care gowns on? I would love to have one of my own. Thank you so much!! Oops--if you need to email me, it's hallierichmond at gmail.com. Thank you and I'll check your comments here too if that's easier! Hallie, thank you. I sent you an email. I make the dress stands. These were done 4 or 5 years ago and they just needed some repair and freshening up. I am so envious!!! One of these days I am going to get there!!! I can't wait to hear more about the trip!!! Did you see that dress?